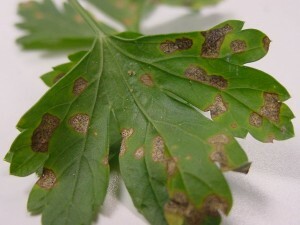 Septoria leaf spot (SLS) in Parsley can cause significant losses in fields where it has become established. Like other Septoria’s, the leaf spots produced on parsley look much like the leaf spots produced on tomatoes and other crops. Septoria leaf spot overwinters from year to year on infected debris so long crop rotations of 2 or more years are important to help reduce disease pressure. During the season, SLS will spread rapidly with each subsequent rainfall and/or overhead irrigation event. Therefore, early detection and preventative fungicide applications are key to successfully controlling SLS. Unfortunately, very few fungicides are currently labeled making control difficult. Last summer a trial was done at the Rutgers Agricultural Research and Extension Center in Bridgeton, NJ to evaluate the efficacy of different fungicides (some labeled, some not) for septoria leaf spot control. In this study, 53% of the stems (out of 100) in the untreated control had leaves with SLS followed by 32% and 28% of stems in plots where Quadris or Cabrio were applied on a weekly basis. All were significantly higher compared to plots where other fungicides were applied on a weekly basis. The lack of control with the FRAC code 11 fungicides compared to others in this study suggest that fungicide resistance may be developing in southern New Jersey. As a note, a study from FL in 2012 showed that efficacy with FRAC code 11 fungicides was still very high in that location. Nordox and Kocide (both coppers) and Merivon (fluxapyroxad + pyraclostrobin, FRAC code 7 + 11) provided moderate disease control. The best level of SLS control was in the program where a high rate of Fontelis (penthiopyrad, 7) was applied on a weekly basis. Other fungicides also provided excellent control, but are currently unlabeled for SLS control. x Means within a column followed by the same letter are not statistically different from each other, Fisher’s Protected LSD (P = 0.05). Based on the results of this study, parsley growers who have significant SLS every year and/or have seen poor control in fields where FRAC code 11 fungicides have been used considerable in the past should consider no longer using them due to potential resistance issues. Fungicide programs should include Fontelis at a high rate (16 to 24 fl oz/A) tank mixed with a copper rotated on a weekly basis with Merivon (5.5 fl oz) plus copper. Fontelis has a 3 day PHI and a 72 fl. oz season max. Merivon has a 1 day PHI and 33 fl. oz season max. Organic farmers should use an OMRI-approved copper fungicide on a weekly basis to help suppress septoria leaf spot.